You are here: Home / Extracurricular Activities / Do They Have the Tools Needed? After spending a couple of weeks in an intense fixer upper mode which required the use of multiple tools (belt sander, biscuit cutter, drill, palm sander, and cabinet clamps to name a few), I’ve been thinking about tools and how they impact our lives. There are physical tools that we hold in our hands and there are competency tools that comprise the skill set that we possess. There are some things that the two have in common. 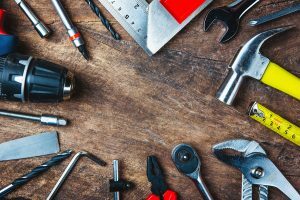 You need the right tools for the job – As my handyman husband has to remind me when I am in a minimalist mode and despair at all the tools he owns, you have to have the right tool for the job. A hammer does not help when you need to drill a hole. A drill is not useful when the shelf needs a final sanding to be smooth. The same is true for the competencies our children develop. Beautiful calligraphy is not advantageous when our child takes their first online AP class and must navigate the platforms necessary to function. Being an accomplished video gamer is not a bridge to successful programming competencies. Skill in navigating social media does not train a student to make an effective business presentation or form important networking connections. Certainly there are things we do for fun, just don’t confuse them with the things that should take up the majority of our student’s waking hours. There is a learning curve needed for the use of any tool – It requires much experience for a beginning carpenter to advance to master woodworker. He or she must learn to understand the type of wood they are working with, the limitations and the strengths. They must master the math involved to create a beautiful piece of furniture and how to correctly use the many instruments for the job at hand. The tools that comprise our skill set also take years to develop. The process of accumulation cannot be rushed. Thus, we have to think about the things we are placing in our children’s tool chest when they are still rather young. What will they need to flourish as teenagers, as college students, as young employees, as spouses or parents? Communication: I wanted them to learn how to communicate in both written and verbal form. This meant much writing and rewriting of essays, position papers, and research findings. Our school required our students to begin speaking in public at young ages and then progressed to organized speech and debate. I knew they would have to write and speak well to be successful in high school, college and career. There are very few jobs out there that don’t require human connection and communication. Math: Even though I wasn’t the best at math, I knew it was critical whether my kids became plumbers or theoretical mathematicians. It is just a part of life and learning to slug through the early years opens up new opportunities for any kid. Listening: So much is being said today and so few people are listening. One thing our family values highly is the ability to ask important questions and then truly listen to the answers. This is the only way to understand others and make them feel appreciated. It is the only way to learn to comprehend what is actually needed on the job or read the body language to recognize what is not being said. How to work: This was a lifestyle choice for us and while neither of our kids chose the hands-on life of the farm or construction, they have the stamina to go the distance in their techie jobs. They work smart, but they also know that any job requires working hard and for long periods of time. Leadership: While not a priority for every family, it was for ours. I wasn’t naïve enough to think my kids would change the world, but I knew that the leadership experiences of success and failure would change them. What are the tools your child needs?